The entire EuroCup season comes down to the final game. This has been the first ever best-of-three series in the EuroCup final and it is going to the wire in an all-Spanish clash. 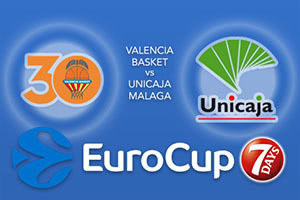 Valencia won the opening game of the series but Malaga roared back with a victory in the second game. This means that the team playing at home has been victorious on both occasions, which may look good for Valencia Basket but this is definitely a game that is up for grabs and both sides will fancy their chances of success. The fact that these teams are domestic rivals will take some of the edge off of the game for Malaga, helping them to feel more at ease than if they were travelling for this tie. They know it will be a difficult task against a side with a fantastic European pedigree but until Game 2 of the series, Malaga hadn’t defeated Valencia this season. With that money off of their back, there is no reason why the away side won’t travel with confidence and the hope of keeping the Valencia Basket fans quiet on Wednesday night. Can Malaga take the EuroCup crown? The second game in the series ended in a 79-71 win for Malaga and they were the much stronger time over the course of the evening. Jamar Smith has been a key player for the hosts in the final matches, offering an average of 11.5 points per game while Alen Omic has chipped in with 10 points per game, as has Jeff Brooks. For Valencia, Bojan Dubljevic is the leading scorer in the EuroCup and he is the leading player at the moment for his side in the finals, offering an average of 12.5 points per game. Guillem Vives has chipped in with an average of 8.5 points per game so far in these finals but in front of their home fans, more Valencia players need to have a positive impact on the game. The bookies believe that the hosts will finish the job and you can back Valencia Basket at -7, which is provided at odds of 1.90. If you’re looking for the Over/Under market for the EuroCup final, go OVER 147.0 which is on offer at odds of 1.90. Bet Now!